There are a few things that we look for when choosing a Digital Nomad destination – good accommodation options, a variety of restaurants, excellent wi-fi, lots of entertainment, and an overall fun vibe. 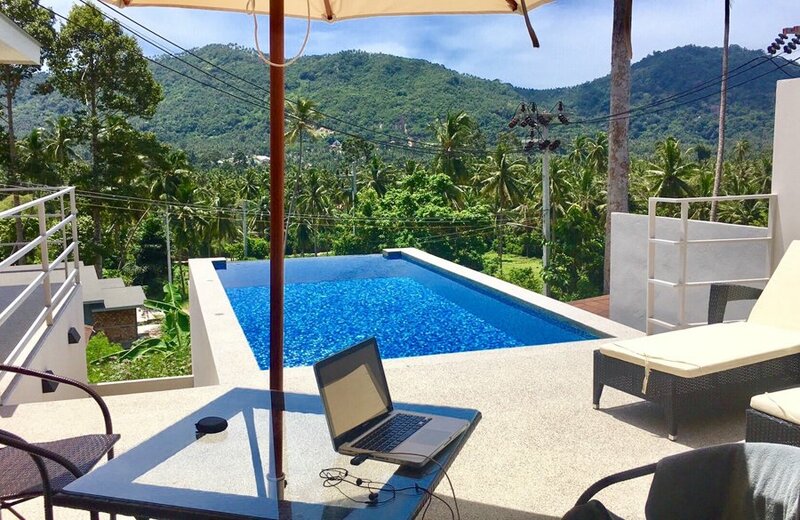 If you’re looking for a place to spend a few weeks or months as a Digital Nomad, Koh Samui Thailand may be the place for you. 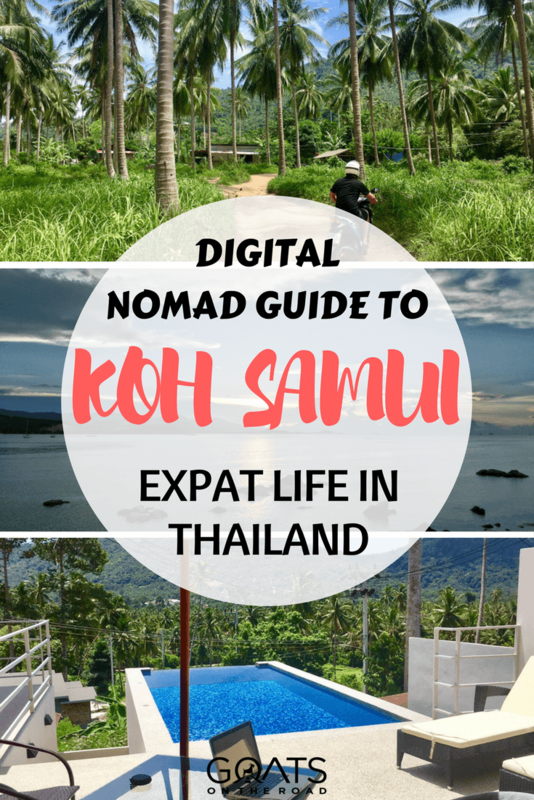 Before setting off for Koh Samui, I couldn’t find much information online about living there as a Digital Nomad, so hopefully this guide will help you out! 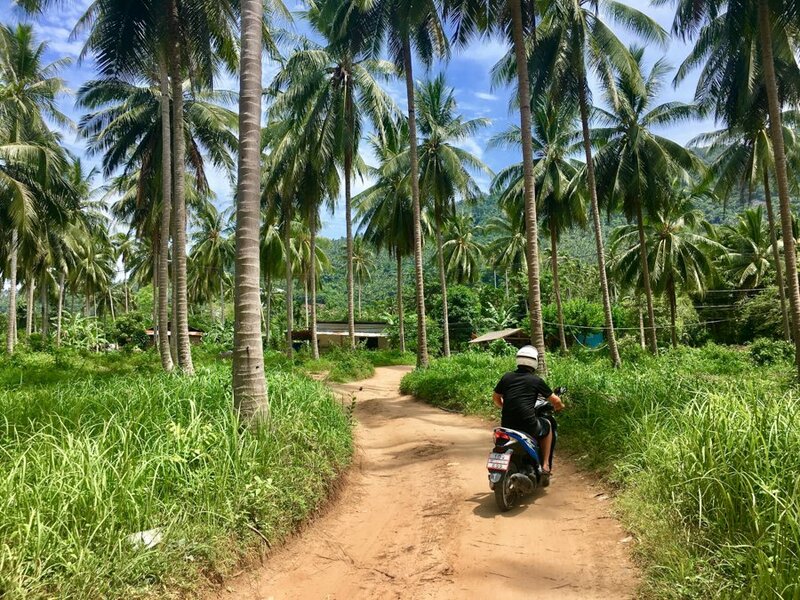 We spent 1.5 months living in Koh Samui and in this guide I’ll share my tips and advice for choosing accommodation, where to eat, what the best areas are, what to do about extending your visa, and more. This is definitely one of the top places to visit in Thailand. Which Area in Koh Samui? Although Koh Samui isn’t the largest island around, it’s a decent size. Choosing the wrong part of the island to live in could mean you end up being too far away from the amenities you want. Or worse, finding yourself in a party zone (unless that’s what you’re after!). In my opinion, if you’re going to be living in Koh Samui as a Digital Nomad, you’ll want to be around the Lamai / Chaweng area (but far enough away that it’s not busy and loud). I’m going to start with this area because it’s where we stayed. We were away from the beach area, back in the jungle. Lamai is the second most popular holiday destination in Koh Samui (Chaweng is first). We were looking for somewhere with enough amenities nearby, that was close to a beach, offered many food options, yet wasn’t overly busy. Beach – the beach here is the second largest on the island. The water at the center and south ends of the beach is deep enough for swimming, while the water at the northern end is quite shallow. The sea is clear and offers calm waves, or none at all. Restaurants – there are many restaurants to choose from. The ones on the beach tend to be a bit pricier. There’s a strip of street food vendors, which serve up delicious food. The only downside is they’re next to girly bars, but if you eat early enough, the bars won’t be open. 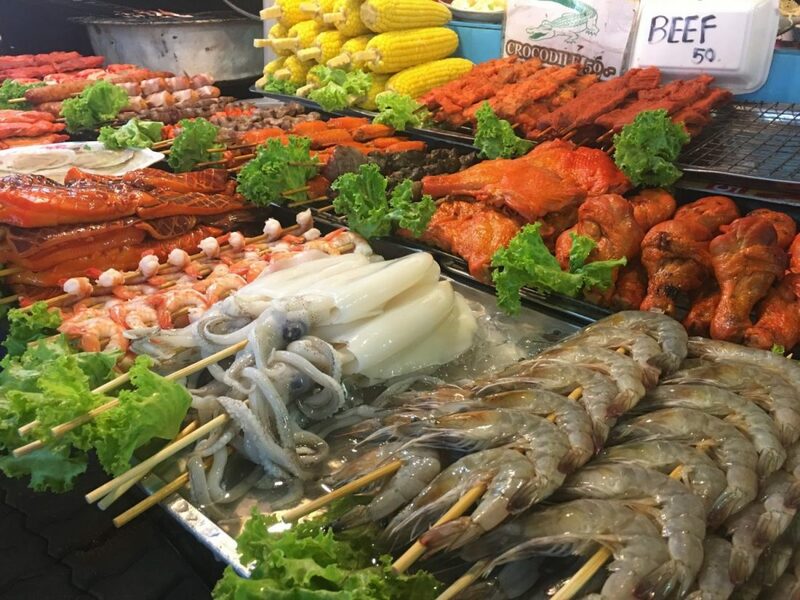 Lamai Fresh Market is a good spot for local foods. Grocery Stores – There’s a large Tesco and a Makro which offers European foods, many of which are in bulk. Makro is a good spot for fresh fish, cheese, meat, fruit and vegetables. Tesco has food, clothing and housewares. We personally didn’t love this area. It’s the busiest spot on the island and is filled with tourists and traffic. This is the only area that we saw traffic lights actually! This is the most popular spot and therefore it has a lot going on. If you’re looking for loads of restaurants, bars, parties, a beautiful beach, and everything in one place, Chaweng is for you. Parties – This is the party place to come if you’re looking to party all night long. The people staying in Chaweng tend to be a younger crowd, and couples. Beach – The beach here is stunning. Soft white sand, palm trees and calm seas. It is quite shallow, however. Shopping – There are loads of shops here for souvenirs, clothes, gifts, etc. Groceries – As with Lamai, there is a Tesco and a Makro here. Lipa Noi is located on the western side of the island, meaning it’s a great place to watch sunset each night. This is a very quiet area, beautiful for visiting. The nearby Nathon is a cool place to check out as well. Sunsets – Located on the west coast, this is a no brainer. Beach – The beach here is beautiful. Shallow water, but really pretty and practically empty. Peace and Quiet – There’s not much around. The closest supermarket is in Nathon. Located in the north of the island, Mae Nam is another area that isn’t all that busy. This is the place to come if you’re looking for a coconut-lined beach, some restaurants and bars, and a quiet vibe. Couples and families – this is a chilled out place, not a party place. Beach goers – the 7 kilometer stretch of sand is gorgeous. Obviously, if you’re looking to stay here as a Digital Nomad, you’re going to want to rent an apartment or villa so that you have your own private area for working. But, if you need somewhere to spend a few nights while you search for your villa, there are endless hotels, resorts and hostels. If you want a chilled out experience, spend some time on the north end of the island before making your way south to the busier parts of Lamai or Chewang. The idyllic Zazan Boutique Resort in Bo Phut is a great option for a short stay. 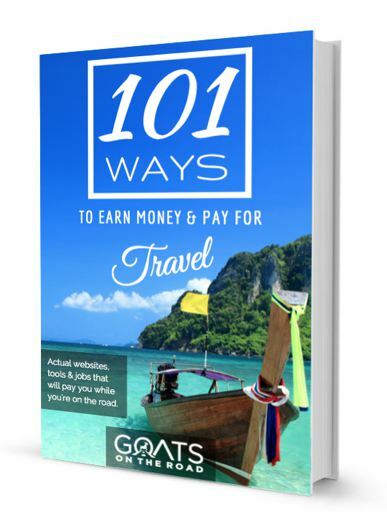 ☞ Heading to the north of Thailand after checking out the islands? 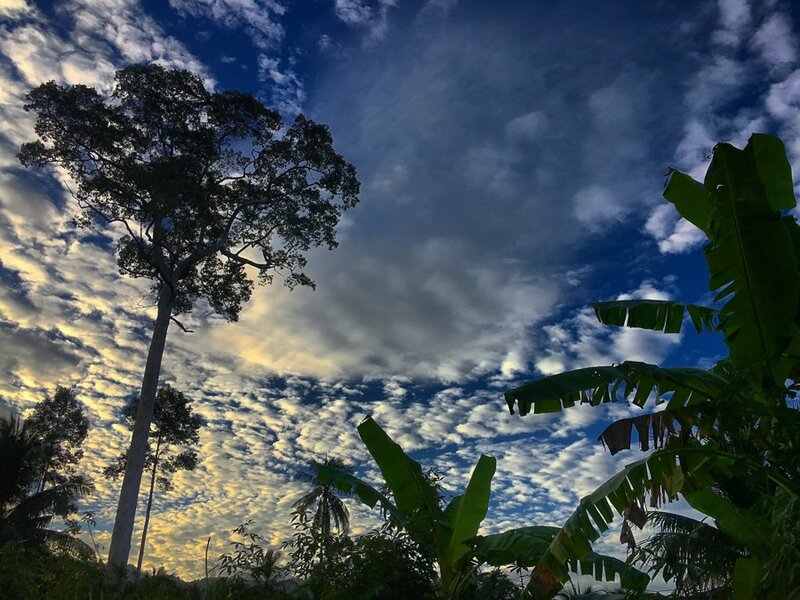 Don’t miss our articles: Things To Do in Pai and Things To Do in Chiang Mai – both are great destinations with lots to do. Airbnb is a great go-to website for short-term rentals around the world. The only problem is that they have a high service charge and cleaning fee added, but often you can bargain down the price with the owner directly. Even though the fees are high, we often still check out Airbnb to see if there are any apartments we like. *Note: If you want to join Airbnb, click here to sign up and receive $37 off of your first stay! Another option is to have a look at local Facebook buy and sell groups, such as this one. Finally, you can just arrive and look around! Hire a motorbike and drive around for the day. There are numerous houses and villas available for rent around the Lamai area. Many of which have signs that say “for rent” with phone numbers. When you find a place that you like, try to pay the rent owing by PayPal or with your credit card so that you have some sort of recourse if there are any issues with the place, or if the owner ends up being a shady character. That’s one big bonus of Airbnb, you’re paying the platform directly, rather than a person that you don’t know. *Note: Try to get a place that includes electricity, but many places don’t. We paid 10,000THB ($302USD) for 1.5 months of electricity. The cost is 9THB ($0.27) / kilowatt, but we received a discount at 7THB ($0.21) / kilowatt. Basically there are four main ways to get around the island. Either by motorbike, songthaews, rental car or taxi. Renting a motorbike for the duration of your stay is what I recommend doing. You’ll want to rent from a reputable company and make sure to take photos of the bike when you rent it. Some companies are much more strict regarding “damage” such as scratches and dings. Our motorbike was rented with James Travel company and cost us 120 THB ($3.63) / day. Petrol is very cheap with a full tank of gas for our motorbike costing 110 baht ($3.33). If you puncture a tire, that’s also cheap to get fixed – 180 baht ($5.40). If you want your own helmet (recommended! ), you can buy one at Tesco for around $10. If you plan to take a taxi around the island, you’ll end up spending a lot of money. From the ferry pier to Lamai, the cost is 600 baht ($18.15). You can rent a car from the airport for around $41 / day, less if you rent for a month. That price is with a local car rental company, as opposed to a more reputable one such as Avis or National. Things To Do in Chiang Mai – Top 17 Places, Don’t Miss Out! Things To Do in Bangkok – 13 Awesome Things You Won’t Want To Miss! Koh Samui has fiber optic internet. Happy days! The speed of the wi-fi varies around the island depending on where you are. Our villa had very fast wi-fi with 33.35Mbps download and 10.48Mbps upload speeds. If the wi-fi at your accommodation isn’t very fast, ask for it to be upgraded. SIM cards are very affordable as well with 4G LTE available around the island. You can pick up a SIM card at the airport with TrueMove. They have numerous packages available from 3 days to 30 days, and 1GB of data to 12GB. Prices vary but the largest 30 day package with 12GB of data and 150 baht of talk time costs $31.75. We bought a smaller package and topped up 4GBs valid for 30 days for 200 baht ($6). There are three reasons to come here – food, view & work. Vikasa is a restaurant, but also a yoga retreat and hotel. The view overlooking the sea from high above is amazing. The food here is wholesome and healthy with many vegan and vegetarian options, and the portions are big as well. If you’re looking for a place to work, this is a good spot. There are lots of power outlets and solid wi-fi. Meals here are from 240 baht ($7.25)…and worth every penny. As with Vikasa above, this restaurant and hotel is focused on health and wellness. Here you can have a detox session or participate in yoga. We only went to the restaurant here which is situated right on the beach. The menu is very affordable and the view is lovely. In fact, out of all the Pad Thais I had while in Thailand this time around, the one here was the best. Food here is from 60 baht. For two people to have 2 Pad Thai (one shrimp, one chicken), 2 whole coconuts and a shrimp rice paper roll, the cost was 470 baht ($14). If you’re looking for roast chicken, jerk ribs and chicken wings, then this is the place to come. Whole chickens are constantly on the rotisserie, and they are served fresh and juicy! You can order 1/4, 1/2 or a whole chicken, and then order salads separately. They also have Thai food on the menu. The chicken and the location right on Lamai Beach make it a top choice. 1/2 chicken costs 200 baht ($6) and can feed 2 people, salads are around 100 baht ($3). Located on the northern end of Lamai Beach, this Thai restaurant has an open air restaurant with fantastic views of the water. It also has very funky accommodation! The prices here are very low and the food is good. Meals are around 100 baht ($3) and up. This restaurant is located at the southern end of Lamai Beach, right on the sand. The setting is great, the staff are very friendly and the prices are good. The grilled fish is tasty and so are the curries. If you like your food spicy, make sure to ask for it that way. The only annoying thing is the menu, as it’s in a bunch of languages and is confusing to navigate! You can sit on the lounge chairs here for free, and if you wait until happy hour at 5:00 – 7:00pm, cocktails are 100 thb ($3). As an added bunus, there’s an outdoor massage place here for 300 baht ($9) / hour – the massages are excellent. This is a great spot to go for quick, cheap and delicious eats. Each night from around 5:30 the stalls here open up and serve some amazing food. Apart from a pizza stall, everything you’ll find here is Thai, Southeast Asian or Indian food. They have skewered meats and fish, curries, noodle dishes, pancakes, samosas and much more. After ordering, you can sit at the communal tables and eat with everyone else, or take it to go. If you eat at around 8:00 and later, the seedy bars surrounding the area start to open, complete with girls dancing on poles. We would go before the bars opened up, or take the tasty food back to our villa. Meals from 60 baht ($1.80). Another local area serving up cheap and delicious Thai food from little stalls, plus housewares and other groceries that you might need. When you’re travelling, eating only local cuisine is what it’s all about. But, when you’re staying somewhere long-term (or even just a couple of months), eating the same food can get old, quick. Thankfully, there are some grocery stores on Koh Samui that offer western food for sale at a good price. There are a few Makros around the island, but the one above is for the Lamai area. The supermarket is open 7 days a week from 6:00am – 10:00pm. If you’re from North America, you’ll understand when I say that this place is a little bit like Costco that we have back home. Makro sells food and housewares (toilet paper, etc.) in bulk. But, it also has items that are sold individually. This is also the place that businesses come to stock up on food for their restaurants. There’s a huge frozen section with Indian curries (very good), fish, dumplings, french fries, fruit, vegetables and more. You’ll also find a good deli with cold cut meats, fresh fish portioned individually, and lots of cheese. There’s also a great selection of produce, fresh seafood and meat. You can only pay cash here and must get a “guest” card when you enter. Note that alcohol isn’t sold between the hours of 2:00pm and 5:00pm (in all of Thailand’s shops). As with Makro, there are a few Tesco shops around the island. Here you’ll find lots of packaged foods (rice, pastas, snacks), canned goods, sauces, and a small selection of frozen food, meat and produce. We much prefered to purchase our meats, cheese, frozen food and fruits and veg at Makro, and buy the other items here at Tesco. But, where Tesco differs from Makro is that they sell clothing, appliances, cleaning supplies, toiletries, makeup, bathroom items, school supplies, outdoor items and sporting goods. As with all shops in Thailand, alcohol isn’t sold between 2:00pm and 5:00pm. At Tesco, you can pay with credit card. If you’re looking to buy wine, this is where you’ll want to come. They have a wide variety of wines from all around the world. The only problem is that there are only a few around the $10 mark. Most of the bottles are $25 and up. Wine Connection is located in the same shopping plaza as Tesco. You’ll also find a pharmacy, Dairy Queen, a Watson’s, an optical shop and a couple of clothing stores. As I noted above, this is a great place to come for Thai food ingredients, local food and fresh produce. Open from 5:00am to 8:00pm daily. Don’t drink the water from the taps, and don’t purchase water bottles! Well, you can buy one 5L jug, but then make sure to refill it. 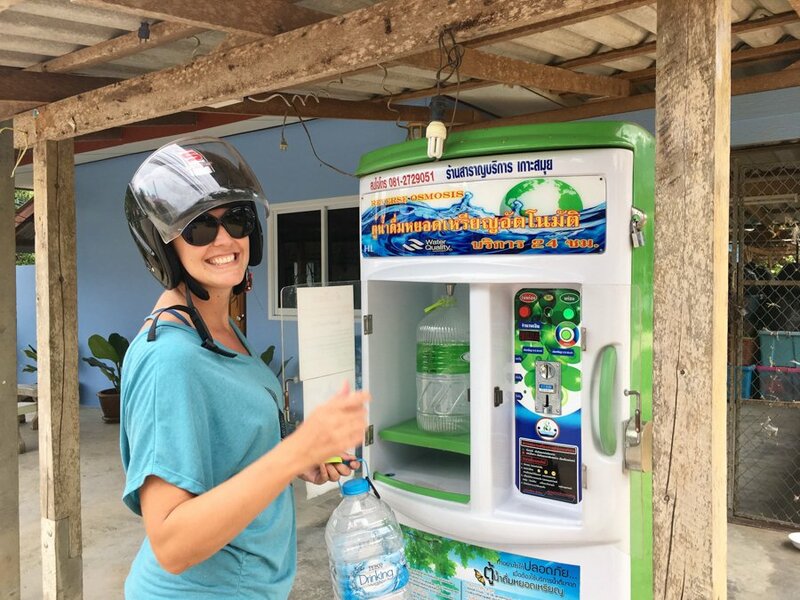 There are filling stations all around the island and depending on how much money you put in, you can fill a small bottle or a 18L jug. For 5 baht, you can fill a 6L jug! Refill your bottles and help save the island from an overload of plastic. Drive the shortcut to MaeNam – the areas of Lamai and Chaweng are busy, and this drive is a great way to get away from the traffic. The road cuts right through the island and is virtually void of cars. The road itself is in good condition and the palm trees and surrounding jungle are gorgeous. Some of the hills are quite steep, but it’s not a hard drive. Look for the signs, or ask around. Visit Lipa Noi – this beach is quiet and beautiful. The drive from Lamai only takes about 25 minutes and is worth it. There are no sunbeds on this beach unless you’re staying at one of the very few hotels, so bring your own blanket and towel. If you’re hungry, check out Big John Seafood Restaurant – the Thai food here is good, and so is the pizza. See The Weekly Market – on different nights around the island, the main cities / towns in Koh Samui have a food and shopping market. Bophut (Fridays), MaeNam (Thursdays), Lamai (Sundays), Chaweng (food court daily, shopping stalls closed Fridays and Sundays). Typically the markets open around 5:00pm. Watch Sunset – if you don’t want to go to the west coast, you can still watch the clouds morph from white to pinks and reds from the Rock Bar or Holiday Beach Club at Lamai. Both have cool rock settings. Volunteer With The Dogs – if you are a cat or dog lover, then consider spending a couple of hours with the Dog & Cat Rescue Samui Foundation. It’s an amazing program helping the homeless animals of Samui. All you have to do is pet and love the animals! Check Out the Waterfalls – there are some beautiful waterfalls on Koh Samui. Grab your bike, bring your towel and head to Namuang Waterfalls 1 & 2 (18m and 80m respectively), and Hin Lad Waterfall (a secluded and peaceful spot). Laze On The Beach – if you’re living in Koh Samui, you’ll probably be spending a lot of time at the beach! Lamai Beach is our favourite in terms of the water. It’s deep enough for swimming, and actually, it gets deep almost right away meaning you don’t have to go out too far. The northern end is really quiet, but shallow, while the southern end (past Black Pearl Restaurant) is quiet and deep. Chaweng is beautiful, but busy and we found that the water was shallow. A cool spot is Silver Beach which is surrounded by rocks. Lipa Noi is peaceful, has beautiful sand and palm trees lining the beach – but the water is shallow. Watch a Fire Show – it’s Thailand after all! 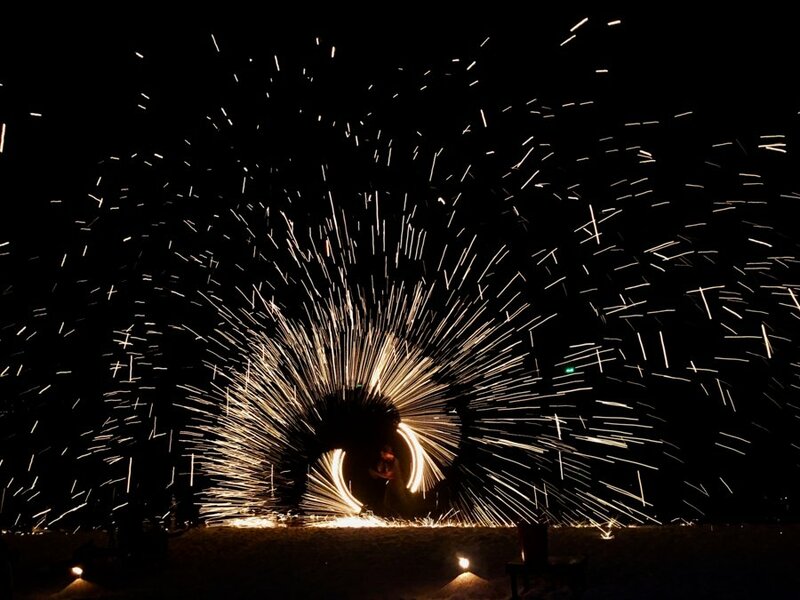 The fire twirlers can be spotted on Lamai beach around 8:00pm at Swing Bar Samui. Join a Yoga Class – At Vikasa, you can drop in for a class at 500 baht ($15) for one, or 3 for 1,000 baht ($30). they have numerous packages, including a day package where you can eat at the restaurant. Click here for prices and details. Head to the nearby island – Koh Phangan is just a 30 minute boat ride away. There are a lot of really fun things to do in Koh Phangan, so head on a boat and check it out! 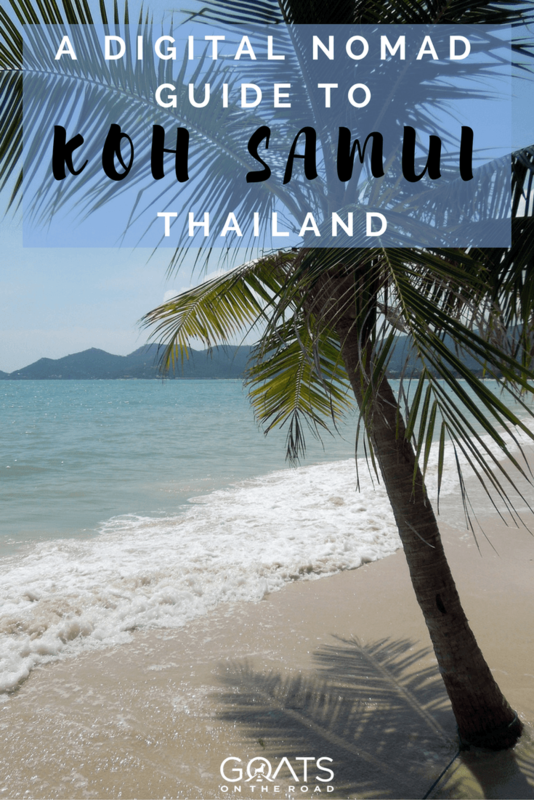 *Things NOT to do: While there are many fun and nature-filled things to do on Koh Samui, this island is unfortunately home to many animals shows (monkey, tiger, snake and elephant). Consider where you want to spend your tourism dollars, and hopefully it’s not on these cruel activities and shows. If you don’t get a 2 month Thai visa ahead of time, you can arrive at the airport and receive a 1 month visa on arrival. If you want to extend your visa, you have 2 options. 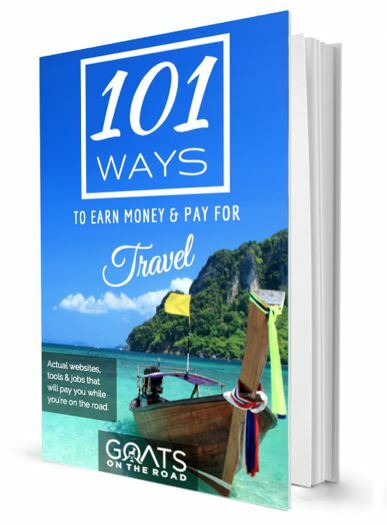 You can either leave the country and return to receive another month-long visa, or you can go to the office on Koh Samui and extend. Pack up your passport (with 6 months validity and 2 empty pages), a photocopy of your passport, a passport photo, a photocopy of the immigration card you received on arrival, a photocopy of the immigration stamp on your passport and 1,900 baht. 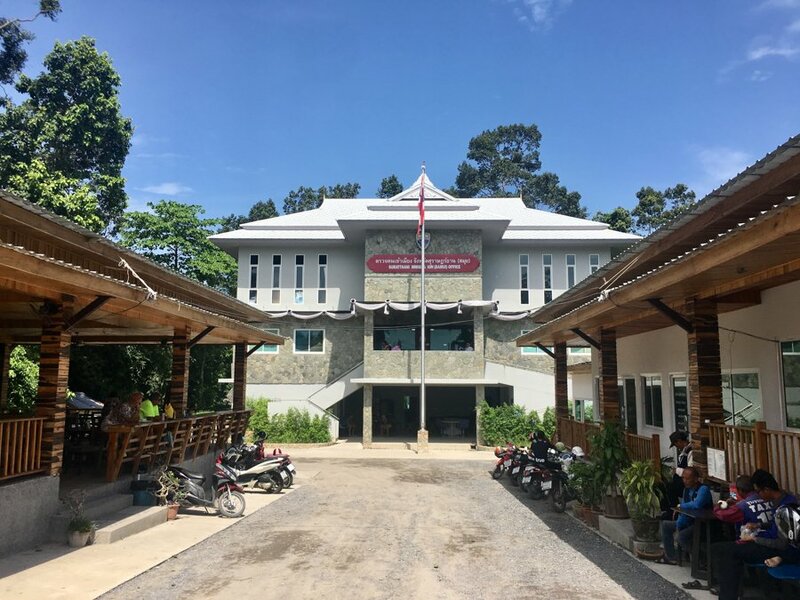 Head to the Immigration office in MaeNam. Click here for directions. Fill out the form at the office outside of the main building (note: you will need your Thai address). Bring your papers and passport inside and submit your documents. Sit down and wait for your number to be called. The extension here is very easy. Everything is done in the same day, within an hour or so. Note that Mondays and Fridays are the busiest, so try to avoid those days if you can. Dress appropriately. If you didn’t have a chance to photocopy everything and get a passport photo taken (or didn’t want to), you can have this done at the office that you fill out the extension form at. Once you receive the new stamp in your passport, just check that the date is correct and you’re good to go! Of course, depending on your lifestyle, you could spend much more than us, or much less. 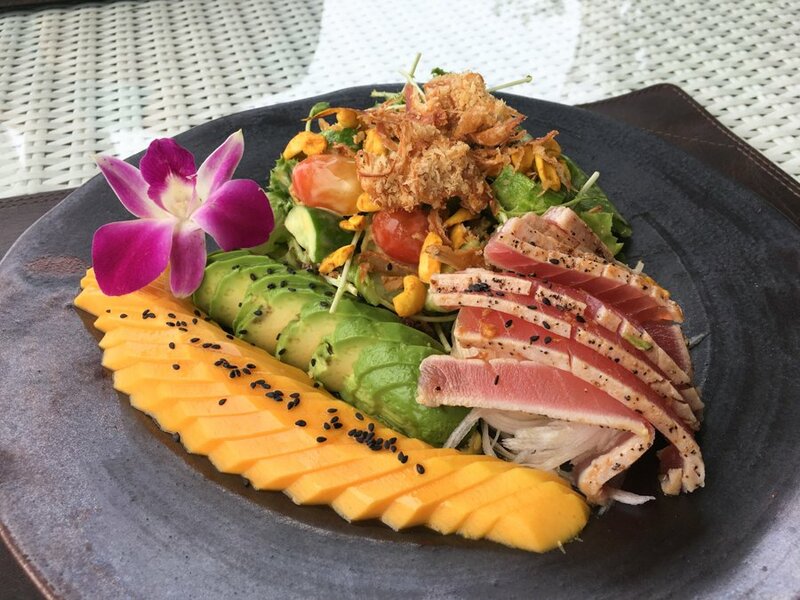 If you eat only Thai food, you’ll spend much less as we were purchasing western food at the grocery stores, and eating Thai food at the restaurants. If you don’t drink alcohol, you’ll save a lot as well. And, depending on which style of accommodation you’re after, you could spend a lot less than we did per month. Living in Koh Samui for 1.5 months was a great Digital Nomad decision and we really enjoyed our time there. I hope this guide gave you some useful information. Enjoy! It was flooded when I first came to Thailand in 2010, so I ended up setting up shop in the North. 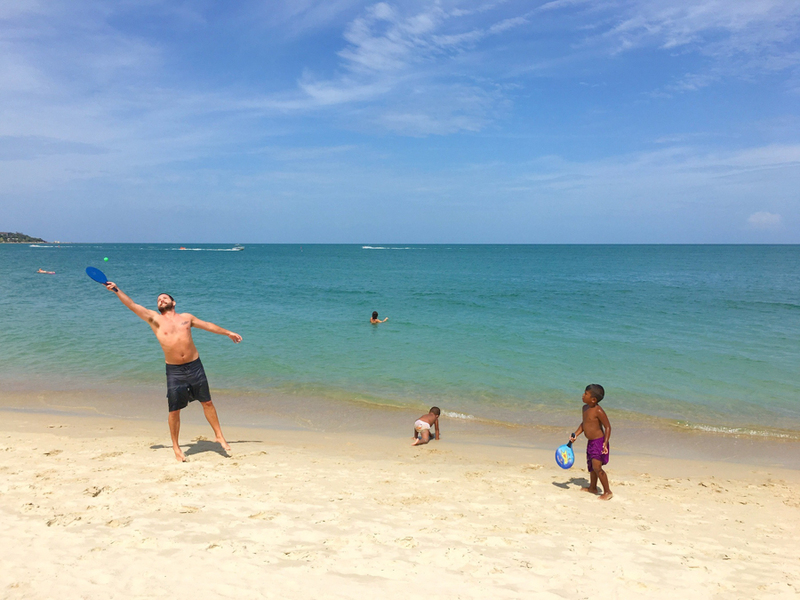 When we finally visited Koh Samui last year, we were stunned by how awesome it was. Great guide. Better than tripadvisor. Hui Hin is also a great spot to set up shop with the kitesurfing season running Nov-April. What’s the weather like? Any months better than others for rain or extreme heat? If you paid 10000 thb for electricity at 7 thb per unit for 6 weeks, then you got ripped off big time 😉 Government price is 3, so you could always negotiate that down. But in the end you DO want a place that handles this separate as this means they focus on long term stays usually instead of Day tourists. So you’ll get way better monthly or even daily rates! Just make sure to take a picture of the meter before moving in… but anyway – great article!! Please please please. To everyone visiting Koh Samui and other islands.. You are very welcome to come! However, please wear proper attire when going around the island– and by that i mean, even if you are in a tropical country, and yes… we now… it’s HOT. Please do not go walking or driving around wearing your bikinis and trunks. Asian people (Thai, Cambodian, Philippine, Burmese, etc) living in the island are conservative people in general. When you go grocery shopping, men– please wear at least a vest and beach shorts. For women, please don’t walk around on your bikinis eventho you have a cover on top. People can still see what’s underneath. It is so improper, impolite and rude. I always see people wearing these on their bikes, walking on the main road, taking public commute (songthaew), supermarkets, temples and government offices especially IMMIGRATION OFFICE. There are signs/reminders of proper attire. Wouldn’t hurt to read and follow, right? Thai immigration officers are nice and will just tell you to cover up. BUT SERIOUSLY. Why come to a government office and wear a bra top? Or be shirtless? It doesn’t make sense. Please be mindful of your surroundings. Respect begets respect. Thank you!! Also.. Vikasa Life Yoga Cafe — WORTH.EVERY.PENNY as the author above mentioned. You will not regret it. Tree House Silent Beach in Maenam is amazing. Check them on TripAdvisor. I could add more but I’m busy now haha. 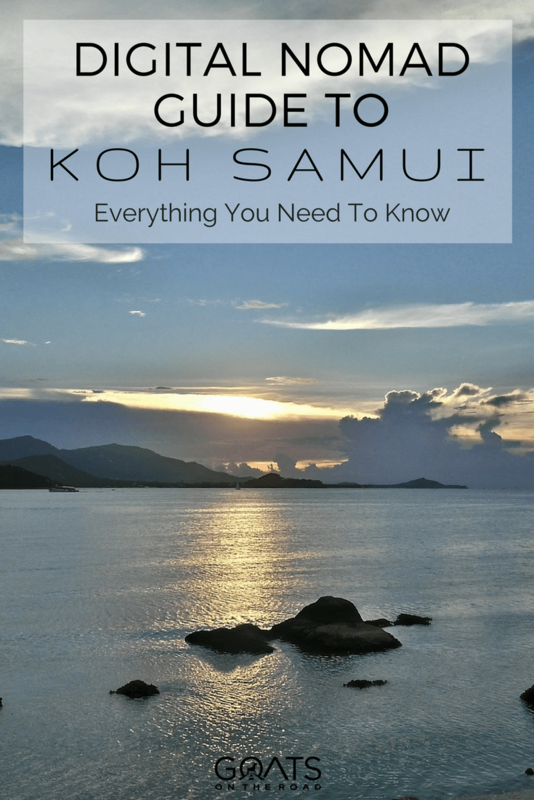 To the author– this is the best Koh Samui guide! 5 stars to you! Cheers! You stayed in/recommended Lamai which is the most sleazy & expensive for accomm on the island, also has nothing near apart from Silver Beach (daytime) – so your stuck in the evening. Sunday Walking St & Beach Republic for sunset cocktails are the only two things would go to Lamai for in the evening.. Depending on what you want any of Fishermans Village, Bophut, Maenam, Bangrak, Ban Tai are better options, they are all cheaper, have more diverse acomm – (can live in a villa right on the beach for what you paid) each has its own evening scene & your only max 15 mins from Chaweng if thats your thing..
Everyone has differen’t tastes, check in somewhere for a few days, rent a bike or car(btw can rent a car starting 700b/day 7000b month) when you find somewhere you want to stay longer term jus book it direct, as a guide prices from 10,000b month 2 bed villa shared pool, good luck everyone and enjoy the island, good call on Koh Phangan for a couple of nites! Hey Marshall, thanks for your additions to the post. This article isn’t really for travellers, as it’s more geared towards longer stays (as in, 2 months). Because of this, people will have to pay the “short term” price, obviously the longer you stay, the cheaper it’ll be. As a traveller, sure, the other areas are quieter and perhaps more enjoyable. But, we liked where we were a lot and had a lovely nature walk nearby as well. For nightlife, we aren’t big on bars, so we’d go out for a nice dinner or the market. Chaweng is very close by if you wanted to party there. Having a motorbike is the best bet for being mobile. We also were right on Lamai Beach, which is massive plus as you said, there’s Silver Beach. Having all the grocery stores nearby was something we wanted as well. Thanks again and enjoy Koh Samui!